I want to share a video with you today created with the Made to Bloom project kit from the Occasions Catalog. It’s a wonderful kit that will have you blooming this Spring. Create a dozen cards quickly and easily. Save the cards and use them for your own occasions this year or, give them as a gift for Mother’s Day. The acetate box is just an added bonus to the kit. I love when our kits come with boxes and/or packaging. It makes the process of giving gifts easier as well as storing them. 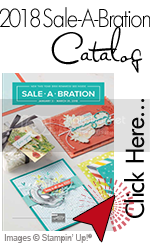 If you love this kit, be on the lookout for many other videos showcasing our Occasions Catalog products as well as our Sale-a-Bration products. Remember, Sale-a-Bration runs through March 31st. Order your products for blooming this Spring through my online store. 2013-2014 Stampin’ Up! Annual Catalog has ARRIVED!